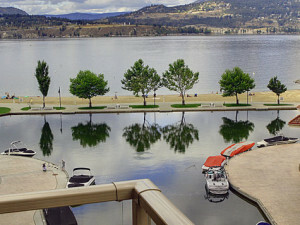 This 8th Floor, 2 Bedroom, 2 Bathroom suite features Lake and Pool views. The Master Bedroom provides a King Bed and Ensuite, 2 Twin beds (T2K) in the second bedroom and a Queen sofa bed in the Living Room. This suite is equipped to accommodate 4 guests (5 if one is on the living room sofa bed). 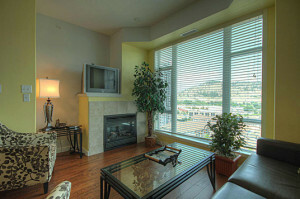 There are 3 tv’s located in the master bedroom, living room and second bedroom. Full cable service along with high speed internet, as well as extra towels and linens, washer and dryer and laundry supplies and a gas BBQ on the deck. Within the secured, undercover building parkade you will find a reserved SINGLE car space. 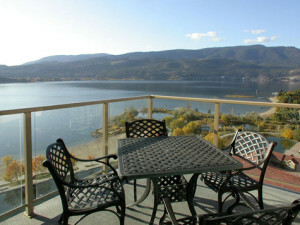 Views of Lake Oanagan and over the outdoor pool with early morning sunshine on the deck.